A subsidiary of the Russian gas monopoly Gazprom has decided to produce satellites. It plans to assemble and sell 44 apparatuses by 2030 at a total cost of $6.5 billion. The company also intends to export a part of the satellites. Russian gas giant Gazprom’s space subsidiary, communications satellite developer and operator Gazprom Space Systems (GSS), has announced plans to launch its own production of satellites by 2018. Investments in the project will amount to 17 billion rubles ($252 million) and the enterprise's power capacity will enable it to produce four communications and Earth remote sensing apparatuses annually. The market price of each satellite is approximately $150 million. Gazprom's subsidiary has never had its own satellite production. It bought all the apparatuses from the satellite monopoly, Reshetnev Information Satellite Systems. At the end of 2013 GSS also signed a contract with the French company Thales Alenia Space for developing the Yamal-601 apparatus. Igor Kot, a representative of Gazprom Space Systems, told the RBK business daily that the company has decided to build satellites autonomously in order to reduce their costs and production period. 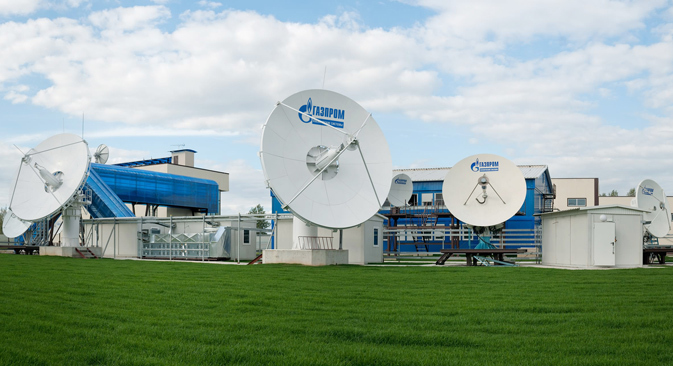 The company calculates that, due to the decrease in the share of foreign accessories, Gazprom's satellites will be about 30 percent cheaper than their current equivalents, while the period of their preparation will be reduced by almost 50 percent (by 24-30 months), said Kot. Since when does Gazprom have a space subsidiary? Gazprom Space Systems was established in 1992 to monitor gas pipelines. Currently, it is the second national satellite operator after the Russian Satellite Communications Company. It estimates its share of the communications via satellite market to be at about 30 percent. The company owns the Yamal satellite system, which consists of four apparatuses. No more than 10 percent of the company's telecommunications services are destined for Gazprom: The other clients are Russian service providers, government organs and foreign companies (about 30 percent). Experts believe that Gazprom's decision to launch its own satellite production could have been influenced by Western sanctions on Russian technology companies, part of the economic restrictions on Moscow imposed by the U.S. and Europe over its role in the Ukraine conflict. The gas giant needs to protect itself in advance from the risk of not having communications services, said Boris Rybak, General Director of Infomost. Currently, about 50 communications and 30 Earth remote sensing satellites are launched in the world every year. GSS intends to obtain a 5-percent share of the world satellite market. According to Andrei Ionin, an expert from ROEL Consulting, the heavy satellite market is basically already divided among five main players – the American firms Lockheed Martin, Boeing and Loral, and the European companies Thales Alenia Space and Airbus Defense and Space, but there is still a niche for medium and small satellites. Ionin believes that Gazprom's subsidiary can "start conquering the foreign market with the Latin American and Southeast Asian countries." There will also be a demand for Gazprom's satellites, if they are produced, on the domestic market, said Boris Rybak. "After each failure to launch a satellite into orbit, it takes a year for new apparatuses to appear. Gazprom can cover part of this "accident" deficit."